An impressive total of thirteen Victorian scholars were sponsored to attend the 2017 Crawford Fund conference this year in Canberra, with four of these sponsored by the Victorian Crawford Fund Committee. 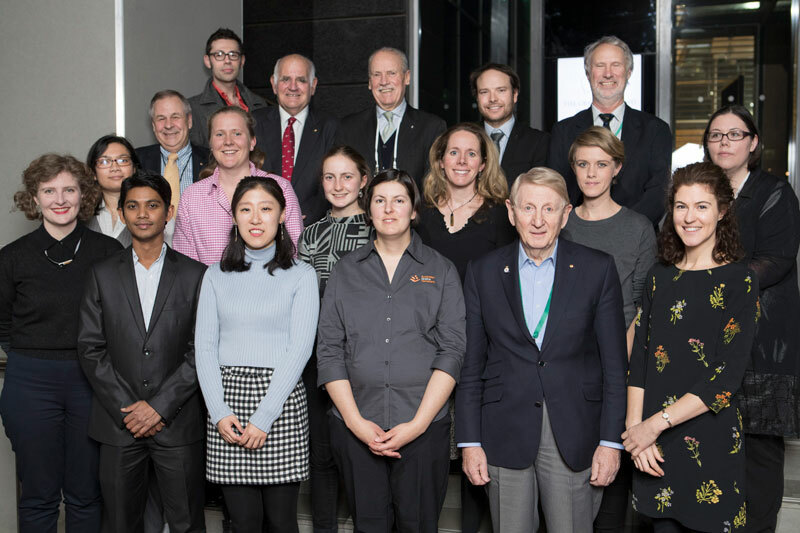 In addition, we are pleased to have had two scholars each sponsored by Deakin University, The Gardiner Foundation and Marcus Oldham; and one Victorian scholar each sponsored by CSIRO’s Australian Animal Health Laboratories (AAHL), Elanco Animal Health and the University of Melbourne. ‘Nutrition sensitive agriculture’ was a powerful message for me from the 2017 Crawford Fund Conference. The need for nutrition sensitive agriculture was beautifully captured by Dr Lindiwe Sibanda’s story of her grandmother’s farm. The damaging changes made to the farm to make money in the name of a better life, remind us that agriculture extension must be delivered hand-in-hand with nutrition and health education. The conference also highlighted to me that any action to ensure global food and nutrition security must be complemented by family planning. Having a background in sustainable agriculture, I was excited by Dr Mario Herrero’s findings that more diverse landscapes produce more food and more nutrients. His concepts of using nutrition as a driver for shaping industry, promoting sustainable intensification without losing diversity, and using policy to influence industry structure, are relevant both locally and globally. He also reinforced the need to promote better linkages between agriculture, nutrition and health. These speakers made me reflect on and question our own local agriculture practices and industry structures. It highlighted the need to shift our industry focus from production to nutrition, to ensure healthy populations. Another key message from the conference was the importance of understanding what happens inside the household, to understand practice change and nutrition security. The impact of domestic violence, imbalance of power and division of labour is paramount when considering these issues. Educating both men and women, starts the conversation inside the home which leads to better adoption. This concept of reaching more than one person in the household to enable practice change, is relevant in an Australian context also. I found Dr Andrew Mude’s presentation on insurance and risk greatly insightful, in particular how risk makes farmers poor, and keeps them poor because it deters investment. The conference highlighted the incredible innovations in agriculture technology that are being implemented. In particular the impact of connecting small holder farmers with information so that profits are shared more equally across the supply chain. Also connecting farmers with information to aid the adoption new production practices. Currently working in agriculture and rural development policy in Australia, I am able to draw significant parallels between issues for farmers in a developing context and locally. Issues include ensuring healthy and diverse landscapes, agriculture technology driving rural change, migration of young people to cities, connecting people to enable prosperity, and achieving adoption and practice change. The conference provided ideas and solutions to address issues, and insights for how government and policy can stimulate change. The conference helped me to clarify my interests and future directions, which lie at the interface between humans and landscape, and ensuring agriculture provides nutrition for healthy and happy people. The conference content was stimulating and interesting, but the networking and conversations were the highlight. It was a pleasure to meet many of the Crawford Fund board members, and the interesting and talented scholars. In particular those scholars who were from developing countries and who were able to share their personal experiences. It was a great privilege and honour and to attend the conference as a scholar, and I look forward to ongoing interaction with the Crawford Fund in the future. This conference was an eye-opener in many ways. Among the many activities and talks, interacting with other scholars and attendees was the highlight of the event for me. The conversations provided me perspective on the involvement of a diverse group of experts all working for a common goal. This led to the opportunity to recognise the roles of different attendees, their contributions and how it affects farmers both in Australia and in developing countries. This ranged from scientists dealing with farming in developing countries or climate change all the way to policy makers. Not to mention, the conversations helped me understand what role I play in the grand scheme of things and the direction I could move into post PhD. In terms of topic, from my perspective, ‘big data’ would encompass genomic, phenomics, nutrition and even climate data. With Dr Ken Street talking about genebank mining and Dr Mario Herrero on nutrition, they encompass the build-up and even simplifying the search for these types of data. This conference, however, enlightened me on a different complexity of the agricultural industry where these data are of distant importance to small farmers in developing countries. Important as it is to scientists to aid them, the data collection of crops and herds along with environmental observations and trade of everyday dealings would accumulate a different kind of data. This could be as simple as data entry of total produce or even planting records. With this, farmers can increase their yield while suffering minimal loss. Another topic that I found interesting was how do we communicate or impart these data and knowledge to farmers or even vice versa, which is collecting data from them in rural areas. It never occurred to me how valuable this exchange of information is, be it on how to combat new pathogens and pests invading farmlands for them to receiving data of their production. To impart knowledge or receive data from someone so isolated seems like a major task but yet it is now being made possible. The brilliant ideas of apps and call centres, be it from MAD, or other organisations, can connect farmers with valuable information while building up an agricultural digital ecosystem. In what way would this affect me though? It affected me in a way to look at my research and the agricultural industry from a different perspective. I cannot agree more with the necessity to improve the technology for farmers, both on field and data wise. The importance of communication between innovators, the scientific community, the farmers and marketers all needing to work together is vital. Lastly, the diversity in nutrition as stressed by Dr Sibanda’s moving memorial address affected me. Coming from the scientific community it is important to know what is needed by the agriculture community and to help push for technological advances to make the agricultural industry among the top industries in the digitisation index. It was an illuminating experience to be invited to attend the 2017 Annual Crawford Conference, “Transforming Lives and Livelihoods: The Digital Revolution in Agriculture.” I was heartened and inspired by the John Crawford Memorial Address delivered by Dr Lindiwe Majele Sibanda, A New Narrative for Ending Hunger. One of the recurring themes of my education has been a focus on systems thinking and I was glad to see her call to action focused on the need to consider the multi-faceted and often complex and contradictory facets of food security. It is imperative that we consider nutrition security while we work towards efforts to ensure food security for all people. I believe that telling compelling stories is one of the most powerful tools we have at our disposal in promoting the work of development. It was a privilege to have Dr Sibanda tell stories of her own family’s experience of changing agricultural practices and the impact it had on her own family. I have since discussed her story with my students studying food systems as an illustration of how global trends can impact individuals. Having access to these personal stories is a powerful pedagogical tool. Over the three days I spent with the Crawford Fund and my fellow scholars it was obvious to me how much of the strength of the organisation rests on the ongoing investment in mentorship. Among my favorite presentations on the first day of the program were those that expanded upon the fruits of long-term mentorships in developing countries. It was inspiring to hear stories about young university students who had, though the course of their association with senior agricultural scientists, grown confidently into their roles as independent researchers. From this first day I was very struck by the re-iteration of the notion ‘to be a T shaped person’ offered by one of the mentors. I am involved in a variety of different activities and work fields and the idea that it is important to be good at many things but a committed specialist to one area of expertise is advice I needed to hear. It was very beneficial to hear the stories of the mentor’s careers and to see how their investment in an area of expertise had manifested over their life’s work. Throughout the conference it was equally inspiring to meet the other scholars and mentees and to learn of the many different careers young people were embarking on to contribute to agricultural development. I hope that the links made during this conference will be the foundation of long and fruitful associations. I found many of the panelists presented on interesting aspects of digital livelihoods. I particularly enjoyed hearing from Dr Mario Herrero from the CSIRO. I felt that his presentation coupled well with Dr Sibanda’s keynote and linked the importance of data to farm productivity and nutrition security. I was pleased to hear his assessment that the key to nutrition security is diverse landscapes and that more diverse farms produce more nutrients. I also enjoyed hearing about the work of Professor Salah Sukkarieh and his work with data analytics and robotics. I was struck by how he has worked to pursue community inclusion in his highly technical field. I loved hearing about how he not only included school workshops in his research but the extra effort undertaken to include parents so that they could gain insight into the technical skills their children were developing. I was especially interested to hear how he was reaching out to indigenous communities to encourage entrepreneurialism for food security. I would encourage the Crawford Fund to make a more active effort towards inclusiveness. I was disappointed by a program that managed 15 per cent female representation. It was heartening to see so many young women in the mentor program but much of the conversation among this group frequently noted to lack of women in the program and how this reinforced the lack of gender parity in agricultural fields. It was also disappointed by the lack of indigenous representation and surprised at the absence of a welcome to country acknowledgement at an event held at Parliament House and the apparent absence of indigenous participants. I look forward to seeing the Crawford Fund make improvements in these areas. Overall the Crawford Fund conference was a stimulating experience and the chance to become part of a network of those passionate about agricultural development is invaluable. I thank the Crawford Fund for the chance to be a part of this incredible experience. I am writing to share with you how I benefited from the Crawford Fund 2017 Conference, “Transforming Lives and Livelihoods- the Digital Revolution in Agriculture,” on 7-9 August at Parliament House, Canberra and what I consider to be the highlights and key messages. I benefited from the Crawford Fund 2017 Conference in three ways. Firstly, I had ample opportunity to network with the Crawford Fund Committee, delegates and scholars during the scholars’ days activities, conference dinner and conference. As a consequence, I was able to meet and build relationships with a wide variety of people involved in agriculture, from undergraduate, master and PhD students, to people working in the private or public sector. I really enjoyed meeting so many people united by their interest in or passion for agriculture and international development. In addition, I was pleasantly surprised by the number of people I met who had a connection to Victoria’s Wimmera region and/or its residents: the Crawford Fund Victorian Committee Chair Dr Gregson, Prof Burgess, Prof Lemerle, my mentor Prof Brown and scholars James Hawkins and Natasha Brohier. Secondly, I was able to explore possibilities for involvement in international agricultural research and development having been allocated a mentor from the industry and actively participating in the scholars’ days activities. My mentor shared with me their career journey, encouraged me to build relationships with people in my current work area and with those whom I would like to work with in the future and helped me connect with other delegates during the conference and scholars’ days. Highlights from the first scholars’ day activities were the relatable and thought-provoking presentations by Dr Sibanda and Prof Campbell. I appreciate the advice they gave while addressing how to break into the international agricultural industry. This included being clear on why you are doing what you are doing, finding at least one thing you can learn from the things you are currently involved in, cross-examining the way you respond to new opportunities and being true to who you are when seeking opportunities for personal and professional growth and development. Thirdly, I increased my awareness of the digital revolution in agriculture and how it can transform lives and livelihoods throughout the conference. The key message that stood out to me from the conference was for people in the agricultural area to work together by increasing collaboration across their various disciplines and sharing information and data that is generated in projects to benefit the lives and livelihoods of smallholder farmers. Highlights from the conference were the practical presentations by Mr Higgins and Prof Sukkarieh which featured fantastic videos showcasing the application of their work with mobile acquired data and robotics, respectively, overseas in the field. These presentations stimulated much interest from conference delegates and highlighted the type of digital advances in agriculture we can expect to continue to develop and impact global food security in the future. Other highlights of the Crawford Fund 2017 Conference included making friends with the scholars I shared an apartment with, networking with some of the scholars before the first scholars’ days activities over morning tea and sharing experiences and reflections of the conference with a few of the scholars at the conclusion of the second scholars’ day over lunch. The Crawford Fund 2017 Conference was a wonderful and enjoyable experience. I sincerely thank the Crawford Fund and its Victorian Committee for the opportunity to attend this year’s conference as a scholar. I was grateful for the opportunity to attend the 2017 Crawford Fund Conference. I learned a great deal in a short space of time and met a range of generous and committed interlocutors. However, the conference also left me with strong misgivings about crucial omissions. The conference appealed to a range of my interests. While my work does not deal with agriculture directly, it considers food systems and food security holistically, and therefore all aspects of food-related value chains are of interest to me. In many ways, the conference’s speakers represent an intellectual community parallel to the food studies scholars, political economists, and urban agriculturalists with whom my work is in dialogue. It was gratifying to meet a wide range of people with expertise different to mine, but with parallel commitments and concerns about food security and environmental change. I was particularly glad to hear from scholars like Dr Lindiwe Sibanda, whose keynote address was the highlight. I was most excited about meeting Crawford Scholars from beyond Australia. The breadth of experience represented at the conference was inspiring. However, I am not convinced that the conference adequately represents that breadth of experience and knowledge. With a few exceptions the panellists seemed to represent a narrow consensus focussed on technological and market-centric approaches to food security. The conference speakers made no reference to global indigenous perspectives, “food sovereignty”, land reform, permaculture, or empirical critiques of market-centric and technocentric development projects. (Indeed, I was surprised to see the phrase “green revolution” used uncritically despite the scholarship criticising its assumptions and effects.) All of these represent serious, necessary contributions to any conversation about food security that were overlooked. Indeed, it is telling that “food security” was a phrase I heard spoken no more than two or three times during the entire conference (aside from Dr Sibanda’s brilliant keynote address). By far, the word “development” was spoken more often. The notion however entails a singular, ethnocentric set of optics that tends to obscure and marginalise a diverse array of peoples and traditions. As such, with the exception of two speakers the overwhelming impression given was of “research for development” as a unidirectional transmission of expertise from western, “developed” nations to non-western “developing” nations, with little explicit acknowledgement of the specific concerns of local farmers, or of the value of traditional lifeways, foodways, or traditional environmental knowledge. In a similar vein, only two panellists made mention of potential conflicts of interest between development projects and indigenous peoples. It is telling that Sibanda’s critique of the loss of traditional knowledge and local biodiversity was largely ignored in subsequent conversations. Reflecting this western-centric focus, the majority of speakers were white, anglophone citizens of developing countries. Indeed, Crawford Scholars from post-colonial nations confided in me that they saw parallels between disparities in representation at the conference and the imposition of western “expertise” during the colonial era. Some of these disparities are beyond the control of conference organisers, of course. For this reason, as a corrective, it seems all the more imperative for any organisation concerned with food security to be deliberate about creating spaces to facilitate collaboration and across numerous perspectives and stakeholders. In future conferences, it is my strong suggestion that a broader range of perspectives are represented, including representatives of global indigenous communities, farmers’ organisations in the Global South, organisations dedicated to “food sovereignty”, and researchers who offer empirical critiques of development projects. While these critical voices were not present, it was disquieting to note that among the voices who were represented was Bayer—a corporation which has recently acquired Monsanto. The critiques of Monsanto’s business practices and environmental practices are, of course, well known. The fact that a company like Bayer was included at a conference about food security while so many other perspectives were not reflects a disparity which I urge the Crawford Fund to address. I remain excited by the commitment that animates the Crawford Fund Conference, and I have profound respect for the impulse to build international relationships with the goal of knowledge sharing. I share this vision, and I urge the Crawford Fund to more deliberately prioritise indigenous peoples, farmers’ organisations, food sovereignty, and critiques of development. The synthesis of development and critique is crucial to securing the food systems of the twenty-first century. My interest in attending the Crawford Fund conference, and associated scholar program, was as a social scientist (and specifically, an anthropologist) working in areas related to food security, land use, and the social and cultural dimensions of land and food resources. I am interested in the possibilities for dialogue between the social and natural sciences. Having worked with food producers and communities in developing contexts (Papua New Guinea, Timor-Leste) as well as in Australia over the past ten years, I am keenly aware of the gaps that exist between the social and natural sciences, as well as the challenges (practical, intellectual, methodological) to productively bringing these approaches into conversation and collaborative exchange. Thus situated, the key benefits of my attendance at the conference were, firstly, the insights it gave me into key debates and themes within the agricultural research arena, and secondly, the opportunity to get a feel for a different research and policy environment to that which I normally participate in. The key themes emergent from the conference included the shifting conceptualisations of food security. This was articulated, particularly, in Dr Lindiwe Majele Sibanda’s eloquent keynote address. In mapping the shifting definition of ‘food security’ from one focused on calorific input to one encompassing nutritional quality, Dr Sibanda’s account of her own life and family experience also included a call to recognise the social and cultural dimensions of food production and consumption. These include the ways that small-holder, diversified plots can sustain kinship connections as well as the health and wellbeing of family members, and likewise the unintended negative social effects that can result from ‘developments’ that focus only on technological or limited scientific indicators of production or health. In this way, there was an interesting parallel between the message of Dr Sibanda’s talk, and the calls of South American and other Global South farmer-based movements, such as La Via Campesina and the Slow Food Movement – to think in terms of food sovereignty rather than food security. It was notable that there was no discussion of food sovereignty at the conference, and also very little engagement at all with the particular issues and concerns related to the effects of food production on Indigenous people (I noted just one reference, in the presentation by Prof. Salah Sukkarieh on farm robotics). These would be areas that the conference might usefully engage in subsequent years. A key message from the global food sovereignty movement has been that we must pay attention to issues of justice, self-determination, power and politics, in thinking about the future and sustainability of food systems. Thus, for example, people should have a right not simply to sufficient calorific intake (or indeed, simply to an adequate nutritional profile), but to foods and food systems that are culturally relevant and enriching, that are ecologically sustainable, and that empower local people and communities. Paying attention to food justice also involves paying attention to issues of food waste, distribution, and the inequalities of access to food and control over its production. It was interesting that while these issues were sometimes raised from the floor, they were largely (with some exceptions, such as Dr Sibanda’s talk), absent from the panel presentations themselves. There was an assumption, and often an explicit assertion, that what is needed to achieve food security is ‘more food, produced more intensively’. Paying attention to political economy, history, anthropology, and development studies, however, also tells us that often what we need is better use and more equitable distribution of the food we already have. The agriculture for development space is, as many delegates and speakers noted, transforming. This was evident in the differing perspectives that many presenters brought to bear, and it was particularly evident in the high level of representation at the conference from corporations and private, for-profit interests. Perhaps, as the Crawford Fund continues its important work of advocacy and dialogue, there might be space to expand the possibilities for exchange between the social and natural sciences, and to also include more explicitly the voices of Indigenous people, social movements, and food justice activists. This year, I was fortunate enough to participate to the “Crawford Fund Conference 2017” as a scholar funded by the Gardiner Foundation. I felt this conference as an invaluable opportunity to connect with established professionals in the various research disciplines, to search for what are the opportunities available locally and internationally for young scientists and to learn about the novel trends of agricultural development. On the first day of the program, I joined with the other scholars from different parts of Australia representing various countries and research disciplines and had a chance to discuss their research interests which was a really good experience for me. In the evening sessions, we learnt from the experts’ experiences, about the international and Australian opportunities available to develop our professional life and required skills and qualities to adapt to the challenging working environment. Dr Lindiwe shared the challenges she faced during her research and career life as a woman engaged in the agriculture sector. The key message from Prof Andrew Campbell to the scholars was “Be really good at what you are capable of and develop some other generic skills like team work, communication, leadership, networking and conflict management”, because multinational companies are looking for people who can technically fit the job, but they are also looking for the capacity to grow, develop and be able to carry out other jobs in the organisation as well. In the next session, Dr Pham and Kylie shared their experiences in working in a developing country and emphasised the importance of developing relationships first with farmers before expanding the scientific boundaries in that environment. The mentor program was a really helpful event throughout the conference that enhanced our confidence in meeting with reputed scientists and share our thoughts and research interests with them. Prof Lester Burgess emphasised that a mentor should be a wise trusted counselor who can build the capacity and confidence of young people and told the story of how a Vietnam fresh graduate who was very shy at first ended up with many scientific publications including a “Diagnostic manual for plant diseases in Vietnam”. She had developed her communication skills, language skills and team work during her time with the mentor and now she trains the farmers to diagnose the plant diseases in Vietnam. I was really lucky to have Dr Rowen Smith as my mentor who introduced me not only experienced researchers in my area of research but other industry people who stretched my perspectives of the topics discussed in the conference. The networking dinner paved the way to meet people in cross disciplines, get to know their interests, expertise and current work involvement in the agricultural development. Meeting and talking with these internationally recognised experts gave me a great opportunity to make connections which may lead to opportunities for collaboration in the future. During the second day, we heard speeches of how can big data transform small holder farmer’s lives and livelihoods by different angle by each speaker. Titled “Transforming lives and livelihoods: the Digital revolution in Agriculture”, the conference talks focused on how the future research and policies should be directed towards reducing hunger and poverty in developing nations through digital agriculture such as ICT, mobile phones, satellite image processing, drones and cloud computing etc. Further, concerns such as cultural and traditional barriers, lack of knowledge on and access to the expensive devises were also discussed as these might be the possible obstacles in implementing these digitised technologies in the small holder farms in developing countries. Therefore, I realised that this technology will be well established in these societies with time through the generations. However, the potential of attracting younger generation to the agribusiness sector via digital data technology is an interesting trend that was highlighted. My interest in the conference was mainly drawn to the talks that highlighted the importance of collecting normalised, reliable data; the need of balancing the data asymmetry; and, bringing all collected data into a common, interpretable, and actionable platform to be able to be used by farmers, policy makers and all parties who are benefited. It was also highlighted how to combine this information with the ecological indicators and the climate forecasts and projections using Meta models to generate the final forecast, because it is more valid to gather and incorporate data from every possible area linked to agriculture when making final decisions. Finally, many people had concerns in their minds as to how the environment will react to all these issues of climate change, land degradation due to intensive agriculture and deforestation. This point was raised especially because without understanding the ecosystem services and their interactions with humans and animals, incorporating technology might result in unexpected issues. All in all, Crawford Conference 2017 was an unforgettable experience in my student life. As an agriculture student, I have been familiarised with the tropical agricultural systems in my country (Sri Lanka), but this conference expand my horizons to explore how other countries in the world look at the issue of food security and poverty elimination from different angles and apply novel innovative technology to reduce them. Therefore, I must congratulate and thank The Crawford Fund organising committee, RAID network, ACIAR, and the Gardiner Foundation for organising this fantastic event and giving me this great opportunity. I was fortunate to be sponsored by the Gardiner Dairy Foundation to attend the 2017 Crawford Conference. I feel extremely grateful for being given the opportunity as it was one of the most valuable and inspiring events I have attended as a Masters student for many reasons. Hearing from experts and leading researchers about the digital agriculture revolution really captured my interest and exposed me to a depth of knowledge in such a short time. Particular presentations that inspired and challenged me to think differently included Dr Lindiwe Majele Sibanda’s Sir John Crawford Memorial Address, A New Narrative for Ending Hunger; Salah Sukkarieh’s presentation Mobile On-Farm Digital Technology for Smallholder Farmers and Ken Street’s presentation Big Data for Genebank Mining. Dr Sibanda’s eloquent delivery reminded me the power and importance of communication in our field to deliver our message and mobilise the action we need if we are to have global food security. I was mesmerised by the videos of digital farm hand at work presented by Professor Sukkarieh, whilst the use and capacity of a gene bank and big data was a new and exciting discovery for me. One of the most valuable things I took away from the conference were my interactions with people; from the mentorship I received from Mike Taylor, the conversations with extremely experienced and passionate scientists and researchers, to being able to meet other young people with similar passions to my own. It was invaluable to be able to discuss people’s journeys, challenges and optimism for the future of agriculture and the careers options in the industry. A key message that I have taken away from this conference is to ‘be a jack of all trades and a master of one’. It was clear that this advice held true when speaking with conference delegates, presenters and researchers and seeing how important having a multidisciplinary skill set is. I wish to thank The Crawford Fund for putting together such a fantastic conference program and allowing me to attend. It was an incredible privilege to be provided a Crawford Fund Scholarship care of Marcus Oldham College and Crawford Fund to attend the 2017 Crawford Fund Conference in Canberra earlier in the year. With such a relevant topic “Transforming Lives and Livelihoods: the Digital Revolution in Agriculture” it would have been a real shame to miss this event. Having been bought up on the land and having ran agricultural businesses for over ten years I am acutely aware of the importance of technology and software in the Australian agricultural landscape especially due to the relatively unique issue of high labour costs for Australian producers. It was incredible to see that a lot of the technologies being developed or used in the Australian industry can transfer across into assisting developing countries with some of the challenges in their primary production systems. While the conference itself was an incredible experience there was so much more that this experience provided from the learnings from the other scholars, the way it encourages people to converse with as many people as possible to the exposure to parliament house. I would like to express my gratitude to Terry Enright my mentor for being a beacon of contribution and intelligence and providing wise counsel. I learnt a huge amount from being around Terry and the other experienced Crawford Fund associates and believe this is a hugely beneficial part of the experience. The Crawford Fund Conference experience provided an insight into some of the great leaders which have been in and around both primary production, development and also public services and public life. Being exposed to such leaders like John Anderson and Tim Fischer among many others provided a great benchmark for how to charm crowds and carry important messages and I will forever use these people as inspiration for what is possible in leadership. The conference itself provided someone with little experience in development like myself an insight into the powerful and selfless work being carried out by young Australians in Agriculture in developing countries. The work which is being done with ACIAR and associated organisations is clearly providing much needed contributions to the areas in which they work. The works being done in these countries appears to also contribute to the Australian agricultural and science industries through helping to develop young people into resilient, confident and capable individuals. The key note speaker Dr Lindiwe Majele Sibanda provided a fantastic perspective from an incredibly intelligent woman with such a deeply person connection to development and issues facing some of these populations. The fact that the term “food security” needs to be viewed as a wider context beyond food supply and that there needs to be a focus on informing policy makers and educating populations to ensure populations are properly nourished. I am incredibly inspired by the messages and learnings I was lucky enough to get from the Crawford Fund Conference and hope that in my own research into soil science can aid in increasing agricultural productivity into the future. With the inspiring mission “For a food secure world” and a 2017 theme of “Transforming Lives and Livelihoods: The Digital Revolution in Agriculture” the 2017 Crawford Fund conference promised to be transformative in building my knowledge and understanding of digital agriculture and food security. As a student in the Marcus Oldham Postgraduate program; I was fortunate to be selected as a scholarship recipient to attend the scholar program and conference. I would like to thank Marcus Oldham College and the Crawford Fund for this opportunity as well as the speakers who dedicated their time to this event and Tim Reeves who was my mentor for the event. From the opening speech delivered by Barnaby Joyce to the keynote speech by Dr Lindiwe Sibanda; I found the speeches inspiring and insightful. Mario Herrero’s analysis from the CSIRO which demonstrated the average size of farms and production capacity of smallholder farms was particularly interesting as was Dr Andy Jarvis’s speech in regards to the digitisation of agriculture. Although I have specifically mentioned a number of speakers I learnt something new and interesting from every single person who spoke. The opportunity to discuss sustainable agriculture intensification with my mentor was really helpful in building my understanding of this field and I appreciated having the chance to network with RAID members and to learn more about their experiences and insights from working in international development. It is clear that the rapid growth in digital technologies has helped to evolve new supply chains, geographical mapping capabilities and data analysis and this will continue to play a large role in building a hunger free world. Digital technologies will continue to evolve at a rapid pace and this is likely to disrupt food and agriculture industries more into the future. Already traditional supply chains are being challenged and the use of digital technologies in developing countries to overcome issues is inspiring. There are a lot of different viewpoints about how we feed the world and it was important to be able to open my mind to understanding different opinions and viewpoints. I probably came away from the conference with more questions than answers but I feel that was one of the strengths of the diversity of speakers and scholars because it’s important to ask questions. I came away from the conference with a determination to focus on the data and to make decisions based on the science and to keep asking questions. Ultimately, I came to understand that achieving a hunger free world is a huge and complex challenge and it requires the technology to do things differently in a world with a growing population and a changing climate. Equally, it requires passionate, connected people to collaborate to design new solutions to old problems and that is what the Crawford Fund achieves by bringing together people with diverse backgrounds and interests. Thank you for the opportunity to attend this event, to meet with like-minded people, to learn and to start asking questions. I am so honored I’ve been sponsored by Crawford Fund this year. As a first-year graduate student, I am always expected to know what my potential career will look like and the Crawford Fund Conference offered a good opportunity to answer my question. In the conference, the most exciting technology would be robotic technology presented by the University of Sydney. Everyone was fascinated by the latest technological improvements and imagining if this technology would be applied in practice massively one day. This drives me to think if there could be a method in a reasonable price to be afforded by farmers and government. To balance science, technology and markets would be a tricky issue but also interesting research topic, because in my point of view, technology added market value would value the most. The ideas from this section gave me an innovative idea for my research project. Our research team is trying to establish a meat premium product system model reducing food wastage and other costs in the value chain, but we didn’t test this model in its profitability level yet. The theme “for a food secure world” attracted many scholars who focus on agricultural development in developing countries. Among all scientific researchers, QR codes presented by Dr Pham Thi Sen impressed me a lot. In China, QR code is the most popular way to pay for all bills, such as electricity, water, restaurants, even online shopping, but we never utilise this as a traceability tool to win customers’ trust. I am thinking probably we will also apply WeChat payment or Ali pay (a Chinese version of Paypal) into the traceability system in the future. I was attending few Big Data Conference in Beijing before studying in Australia. It is normal to locate customer’s needs through Big Data network, particularly in online social media, but hardly in agriculture. Interestingly, ACIAR has a lot of research programs on mobile technologies in the agricultural sector. Scientists design an easy understand application and teach farmers to record their farm data in different languages. Dr David McGill even analyse genetics and epidemiology through mobile technologies. I had been thinking of developing an application in animal production, but investors always asked me where the profitability is, and if smallholders are able to use this app on a daily basis. After the exposure of mobile technologies especially research projects that ACIAR have been done in developing countries, I am surprised that farmers’ education level are not lower as we thought, and the mobile phone is quite popular all over the world. Each farmer may even have one or two phones on their hands. It’s quite fascinating that we could have this technology on farms, and the big numbers of farmer users will make this investment profit eventually. Aside from all the interesting and useful research ideas, the Crawford Fund network events kept surprising me from the first night. All my roommates work for different organisations in different regions. It’s a good chance to hear all of them, to share their work experience, and give me a better view of this industry. I’ve never attended such an event that offers students so many social opportunities. I got a chance to talk to excellent scholars from different areas and well-known researchers also loved sharing their past experiences with me. I also developed a good friendship from this event. She is studying the same major as me in the University of Melbourne and we’ve never met before. I am so glad I attended 2017 Crawford Conference and believe that the knowledge I acquired would be beneficial in my future career. Attending the 2017 Crawford Fund Conference, and associated scholar activities, provided a fantastic opportunity for networking, mentoring and thought provoking discussion. I am incredibly grateful to the conference organising committee and the sponsors for providing this opportunity. The benefits of participating range from the more personal, forming friendships and mentoring relationships, to the more professional, connecting with potential future colleagues and collaborators. The dinner preceding the conference, and the break times during the conference, offered us scholars the chance to participate in conversations with others with similar interests from an array of professional pursuits across the full spectrum of experience. Personally, I felt welcomed into this diverse community of individuals so clearly interested in improving the lives of others through a commitment to developing agriculture, whether via an anthropological or geophysical perspective. The introduction to this community encourages me that we can work toward a future where research groups and projects collaborate through interdisciplinary teams rather than silos. Attending the Crawford Fund Conference has encouraged us to continue to develop into ‘T’ shaped people, able to help this world by developing into an adaptable jack-of-all trades and master of one. Interestingly, two common discussion topics featured in the conversations had with other scholars over the three days. The first surrounded the desire to remove the tendency to think, and act, in silos. The second was the belief that including gender and socio-cultural issues in the discussion around agricultural development is essential for progress toward a food secure world. Throughout the scholars’ days and in listening to the questions from the audience throughout the conference, I was struck by the number of enthusiastic, articulate and intelligent individuals passionate about shaping the future. The questions raised included concerns over data security, sensitivity to gender and culture, accessibility of data and the practicality of technologies. I greatly appreciated the speaker’s attempts to earnestly approach each of these questions. The potential for digital technology to improve food production both directly and indirectly, and the importance of food, environmental and nutritional security was emphasised throughout the conference. The speakers eloquently described how the use of ‘big-data’ and digital technology can help improve agricultural productivity and thereby the quantity and/or quality of food production. From the ensuing discussion, my take home message was that we must ensure that environmental, nutritional, social and health security are not compromised in the process. The conference program made me think about how important the latter two, social and health security, are to the afore-mentioned trio of food, environment and nutrition. Adding socio-cultural and health (animal, plant and human) to that trio forms a functional five part Venn diagram of interrelated needs of similar importance. Dr Lindiwe Majele Sibanda, the jewel in the crown of the conference, inspired these conclusions. Her impressive oration delivered an impassioned plea for the importance of nutrition sensitive agriculture, for instilling youth with a passion for agriculture that elevates it from an essential to a potential for the entrepreneurial and for following your dreams independent of the perceptions of those around you, and the doubts within. Taking part in the Crawford Conference this year was an eye-opening experience. The conference topic, how big data can contribute to providing international food security, is a fascinating topic and being immersed with people passionate about it really expanded my understanding of international agriculture and the use of technology. There were a lot of topics and areas explored over the two days, from seed banks, to small holder farmers, to the use of apps in research, to data sharing. A few of the speakers’ that resonated most deeply with me included Dr Ken Street’s exploration of the FIG strategy, Dr Mario Herrero’s depiction of the distribution of farmers across the globe, Dr André Laperrière’s discussion on open data and Dr Lindiwe Majele Sibanda’s inspiring discussion on the changing face of agriculture in Africa. Introduced by Dr Lindiwe, the concept of providing nutritional security and nutritionally sensitive agriculture, was a key take away from the conference. The idea led to many discussions around different ways this is possible; from a supply chain perspective, to improved genetics, revolutionised pricing pay strategies and, of course, improved education. The different ways in which people discussed nutritional security acted as reminder as to how multifaceted the challenge of international food security is. I realised that there are many ways to skin a cat and even more ways to approach improved food security. Professor Salah Sukkarieh’s presentation, “Digital Farmhand – data analytics and robotics for food and nutrition security”, was a fascinating display of how computer science will change the future of agricultural labour. It was great being a part of the scholar group where people had a variety of backgrounds. After Professor Salah Sukkarieh’s presentation I had an excellent in-depth discussion with an anthropologist about the social implications of projects like the robotic farmhand. It was discussions like this that reinforced to me how important it is to take a multidisciplinary approach to international food security. Additional to the quality of speakers, much of what I learnt from the conference came from discussion with other scholars, mentors and attendees. Discussing international food security and the development of agriculture made me consider in greater depth what my contribution to this challenge will be. This sparked greater motivation and has led me to spend two months of the summer volunteering in Malawi on an agricultural project. I am very grateful to the Crawford Fund and to the University of Melbourne’s Faculty of Veterinary and Agricultural Science for giving me the opportunity to learn from leading researchers and meet with like-minded individuals. It was brilliant to be a part of the 2017 Crawford Fund Conference and I look forward to next year!